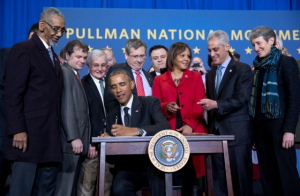 As of Feb. 19, 2015, President Barack Obama proclaimed that the Pullman district is now one of the three newest national monuments in the United States; the Pullman National Monument is located in Chicago. Pullman Wheelworks was built in 1920 and was originally used as a manufacturing facility in the Southside Chicago Pullman neighborhood. In 1980, Mercy Housing converted the historic Pullman Wheelworks property into the Pullman Wheelworks Apartments, multi-family affordable housing with 210 units. The rehabilitation of the property ensured that all the historically significant features of the building were preserved, and not forgotten. The renovation included many green upgrades and some of the apartments were converted to accessible units for people with disabilities. Congratulations to Mercy Housing Lakefront for redeveloping the historic building and ensuring to help better the community by providing affordable housing for 452 people!